- Publisher Have you ever wondered how a "nice" person like you could be so misunderstood, even hurtful? 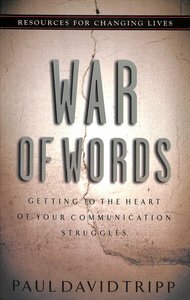 Tripp gets right to the heart of our communication problems and shows how the gospel changes the way we understand and solve them. Learn to bless others with your speech and in so doing, be blessed yourself. Have you ever wondered how a "nice" person like you could be so misunderstood, even hurtful? Tripp gets right to the heart of our communication problems and shows how the gospel changes the way we understand and solve them. Learn to bless others with your speech and in so doing, be blessed yourself. Paul D. Tripp (D.Min., Westminster Theological Seminary) is Professor of Pastoral Life and Care at Redeemer Seminary, Dallas TX. Previously he was a counselor and Director of Changing Lives Ministries at the Christian Counseling and Educational Foundation in Glenside, PA, and a Lecturer in Practical Theology at Westminster Theological Seminary, PA. He is the author of Instruments in the Redeemers Hands; War of Words: Getting to the Heart of Our Communication Struggles; Age of Opportunity: A Biblical Guide to Parenting Teens; Lost in the Middle: Midlife and the Grace of God; How People Change (co-author); Relationships: A Mess Worth Making (co-author); A Quest for More: Living for Something Bigger Than You; Whiter Than Snow: Meditations on Sin and Mercy; A Shelter in the Time of Storm: Meditations on God and Trouble; Broken Down House: Living Productively in a World Gone Bad and most recently What did you expect? : Redeeming the realities of marriage.